NextGen Player - Canada's Premier Entertainment Blog: LittleBigPlanet 'God of Skipping' Contest, Win Kratos In-Game Costume! LittleBigPlanet 'God of Skipping' Contest, Win Kratos In-Game Costume! Time to put your platforming skills to the test! Our good friends at Playstation Canada have given NextGen Player 5 in-game Kratos costumes to give away to some lucky LittleBigPlanet owners. We're not going to make it easy for you, but we are going to make it fun. For the contest, all you have to do is play the 'Tie Skipping' mini-game, take a picture of your high score, put a NextGen Player sign on it and send it to contest@nextgenplayer.com. Please also include you PSN ID name in the email. The players with the top five scores will win their very own Kratos in-game Sackboy costume and be crowned the Gods of Skipping. 1. 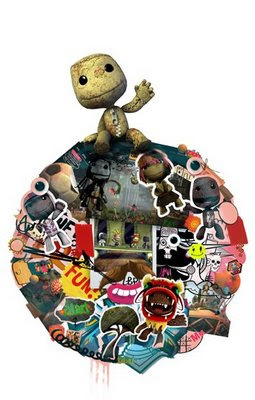 Load up LittleBigPlanet, go into Story Mode and select the Tie Skipping mini-game in the King's Garden. 2. Tie skip your little Sackboy (or Girl) heart out. 3. Take a picture of your high score, with the words "NextGen Player" appearing somewhere in the photograph (so we know it's authentic!). This could be done by writing the words on a piece of paper, marking your hand, or in any other creative way you can think of. The contest ends November 28th, 2008 at 11:59pm EST. We are only accepting one entry per person, so if you enter multiple times, your first entry will be the one that counts. This contest is open to North America only. i will give this a try, but will the codes work with all regions of the game ? Yeah, the codes should work in all regions.